"I couldn't remember the process for peeling the skins off the tomatoes but I ... read full review"
Canning is the process used to preserve fruits and vegetables for long term shelf storage. 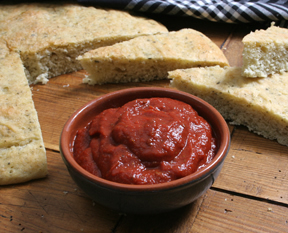 If processed properly, tomatoes can be preserved safely using the canning process. When canning tomatoes, they are placed in jars and heated to a temperature that will destroy micro-organisms that spoil the food. 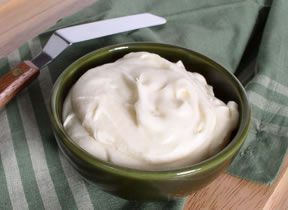 Through the canning process the jar is vacuum sealed so air cannot get in the container and cause contamination. 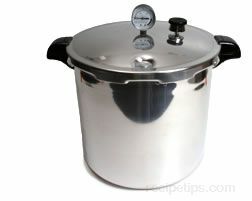 There are two safe methods that can be used, boiling-water-bath and pressure canning. The information below should provide you with what you need to know to safely preserve your harvest of tomatoes. Tomatoes can be canned in a variety of forms. 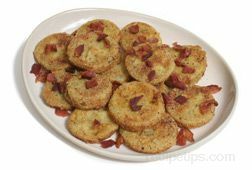 They can be canned as juice, sauce, whole, stewed, chopped, or stewed tomatoes. 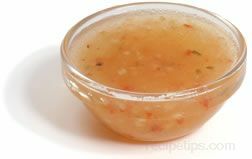 The can also be use to make canned salsa or soup. There are two basic methods for canning, boiling-water-bath and pressure canning. The canning method used is normally determined by whether the food being canned has a high acidity level or a low acidity level. Tomatoes generally have an acidity level that is high enough to be considered an acid food but there are some varieties that have an acidity level that is slightly under the level required. 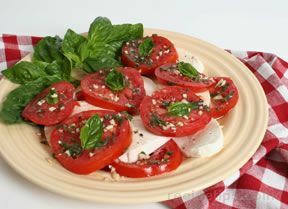 Tomatoes that have a slightly lower acidity level can be made acidic by adding lemon juice or citric acid. The USDA suggests adding lemon juice or citric acid to all tomatoes to ensure acidity levels before canning. 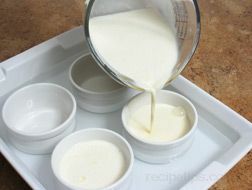 They are then safe to process using the boiling-water-bath. 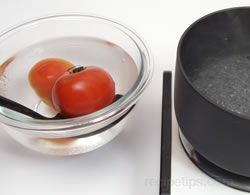 Tomatoes can also be canned by using the pressure canning method. For more information on food acidity in regard to canning, see Canning Vegetables and Fruits - Canning-Food Acidity. To ensure that you produce the best product possible when canning, you must start out with fresh ripe tomatoes. Following the guidelines below will help produce the best canned product possible. Select produce that is fresh, at the proper maturity for best quality of ripeness, and blemish free. Ripe tomatoes should yield to light pressure, but not be too soft. 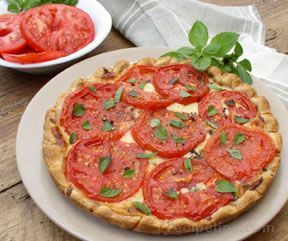 Tomatoes that are fresh from the garden or purchased from a local farmers market will produce better results than those purchased at a supermarket. If purchasing or harvesting tomatoes that will not be canned for a few days, select those that are a lighter red and allow them to ripen fully by storing them in a cool area out of the direct sunlight. 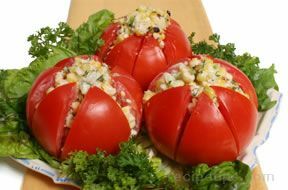 Do not store ripe tomatoes in the refrigerator because this will cause them to become pulpy and lose their flavor. Store at room temperature and out of the sunlight. Ripe tomatoes should be canned within a few days. When getting ready to can your tomatoes, it will be beneficial in planning to have an idea of how many tomatoes you will need to produce a certain amount. This will help in knowing how much you need of other ingredients and how many jars and lids you will need when canning tomatoes. The chart below will help you determine the quantity you have to process. Tomatoes (whole, stewed, or chopped) 2 1/2 to 3 1/2 lbs. Tomatoes (for juice) 3 to 3 1/2 lbs. For information on other ingredients that may be needed when canning tomatoes, see Canning Vegetables and Fruit - Canning Ingredients. When preparing tomatoes for canning, the first thing that is necessary is to clean them. 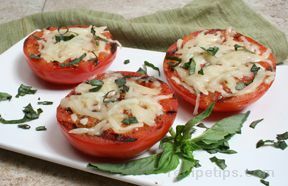 Clean the tomatoes in the same manner you would if you were going to prepare them to eat right away. The main concern is to remove any gritty dirt and to remove any blemishes. 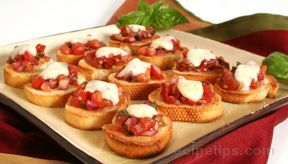 Discard overripe or spoiled tomatoes. 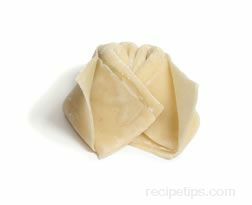 Once they are clean, they can be prepared as instructed by the recipe. The tomatoes are prepared for canning in much the same manner as they are when prepared for other uses. Shown below are some preparation methods commonly used when canning tomatoes. 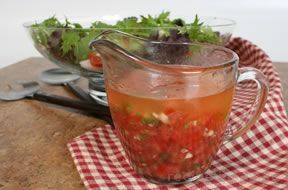 Wash the tomatoes and remove stems and any bruises or blemishes. Skins do not need to be removed. 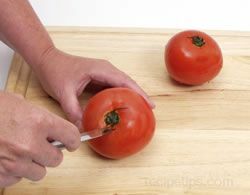 The tomatoes are then cut into quarters and added to a saucepan as they are being cut. Wash the tomatoes under cool running water. 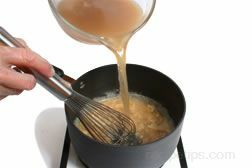 Fill a large saucepan with water up to approximately 1 1/2 inch from the top and bring water to a rolling boil. 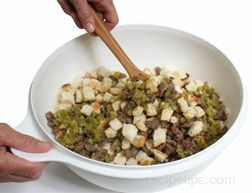 Have a large bowl with cold water set aside and ready to use. 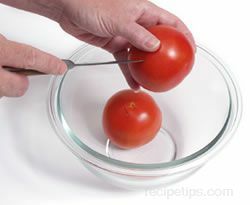 With a large spoon, place tomatoes in the boiling water for 30 to 60 seconds to loosen skin. 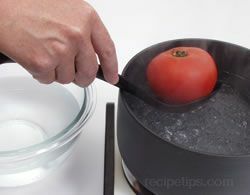 Remove tomatoes from the boiling water and place directly into cold water to stop the cooking process. 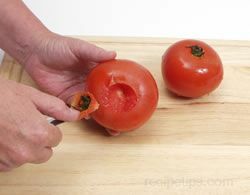 Core the tomatoes by removing the stem with a paring knife and then remove any blemishes the tomato may have. The tomatoes can then be canned whole or they can be cut in half or quarters as directed by the canning recipe. Tomatoes can be packed in the jars using one of two methods, hot packing or raw packing (also referred to as cold packing). 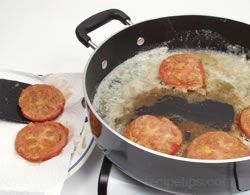 Hot Packing: When using the hot packing method, the tomatoes are cleaned, prepared as instructed by the recipe, and placed in a pan to be cooked. They are then heated to a boil and simmered for 2 to 5 minutes. The hot tomatoes are immediately packed or poured if making juice, in a canning jar. They are then covered with hot water that has been heated to a boil, allowing the appropriate headspace when filling jars. When making juice, it is brought to a boil and poured in the jars, leaving the appropriate headspace. Raw Packing (or Cold Packing): Raw packing, also referred to as cold packing, is used more for both high-acid foods and low-acid foods. When using the raw packing method to pack tomatoes in the canning jars, they are cleaned, prepared as instructed by the recipe, and then placed raw in canning jars. The food is packed firmly in the jars, allowing for the proper headspace. The tomatoes are then covered with water that has been heated to a boil, allowing the appropriate headspace when filling jars. If uncertain as to which method to use when canning, hot packing will be the safest choice. 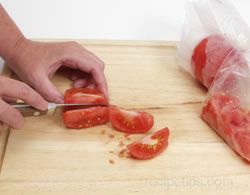 When you are canning tomatoes, either hot packing or raw packing can be used. It will depend on whether you are canning whole tomatoes, tomato halves, crushed tomatoes or tomato juice. See the charts below for suggested methods of packing for the different types of tomatoes using different canning methods. Leave 1/2 inch headspace. At higher elevations, the steam in the headspace will expand more than at elevations below 1000 feet. To allow for this expansion, it is suggested that you increase the headspace by 1/8 inch for each 1000 feet above sea level, not to exceed 1 inch on pint jars and 1 3/4 inches on quart jars. Tomatoes - Juice (with acid added) Hot 20 15 6 lb. 7 lb. 8 lb. 9 lb. Hot 20 15 11 lb. 12 lb. 13 lb. 14 lb. It is very important that the jars are filled properly when canning tomatoes to assist in producing a safe product when the processing is complete. Follow the instructions given below. 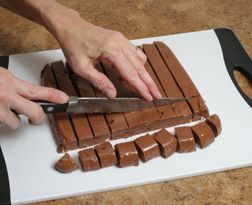 If you have a recipe with special instructions, be sure to follow them closely. Decide on whether you will be using the raw pack or hot pack method for packing the jars. 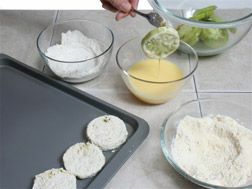 To decide on which method to use, see the information above on the raw and hot pack methods or use the method indicated on the recipe. 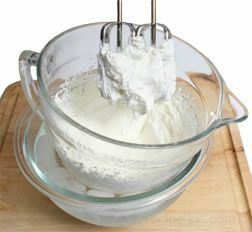 Prepare jars and lids properly. 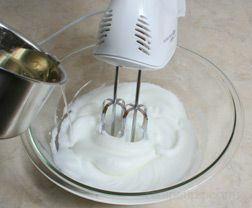 If the jars are sterilized, leave them in the warm water until ready to use. 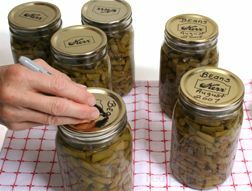 For more information on preparing jars and lids, see Canning Vegetables and Fruit - Jar and Lid Preparation. Clean and prepare the tomatoes for canning as indicated by the recipe. Fill jars according to the pack method being used or as indicated on recipe. Be sure to allow for the appropriate headspace when filling jars with the tomatoes. The headspace is important to allow for expansion of the tomatoes from the heat during processing and to allow a vacuum to form to seal the jars properly. After the jars are properly filled, wipe the top rim and the screw threads on the neck of the jars with a damp cloth or paper towel to remove anything that may have gotten on them while filling the jars. 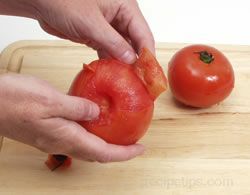 Any liquid or pieces of tomato left on them may prevent the jar from sealing properly. 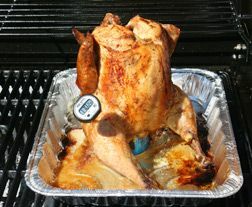 Place the prepared lid squarely on the rim and hold in place while placing the screw ring on the jar. Tighten the screw ring securely but do not over tighten. Once all of the jars are filled and sealed, finish the canning process using the method called for in the recipe. For more information on filling the canning jar, see Canning Vegetables and Fruit - Packing the Canning Jars. Using the proper processing temperature and time is very important when canning tomatoes and other foods to ensure that the processed food will be safe to eat. If not processed properly the food will spoil. There are several factors that will affect the amount of processing time required: shape and size of the jar, whether the tomatoes will be raw packed or hot packed, canning method being used, and the altitude in your area. All of these factors determine the canning method, processing time and PSI (pounds per square inch) of pressure to be used. Be sure to follow all canning instructions very carefully. It is also important to adjust the processing times when you are at a higher elevation. The charts above contain processing information for canning tomatoes and the adjustments that need to be made in processing time for higher elevations. If you are unsure of what the elevation is in your area, you can call your local county extension office to request this information. 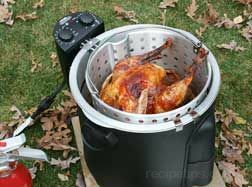 When using a pressure canner to process high acid foods, your processing time is much shorter than when processing with the boiling-water-bath. When processing at higher elevations the processing time can remain the same as what is used at sea level but the PSI (pounds per square inch) needs to be increased to make up for the lower internal temperature of the canner. For more details on processing temperatures and processing times, see Canning Vegetables and Fruit - Processing Temperature and Time. 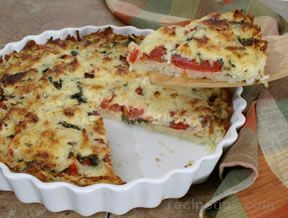 Wash the tomatoes and remove stems and any bruises or blemishes. 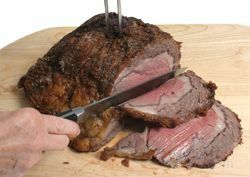 Skins do not need to be removed during preparation because they will be removed when they are strained. Have jars and lids properly prepared (for detailed instructions, see Canning Vegetables and Fruit - Jar and Lid Preparation). 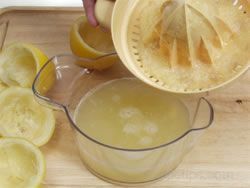 To ensure proper acidity, add two tablespoons of bottled lemon juice to each quart jar (one tablespoon per pint) or 1/2 teaspoon of citric acid (1/4 teaspoon per pint). 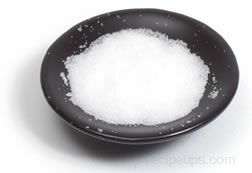 Add 2/3 teaspoon of salt and 1 1/3 teaspoons of sugar to each quart jar. 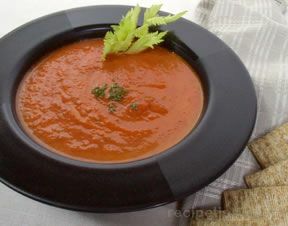 Pour the hot tomato juice into the prepared jars using a ladle. Fill the jars, leaving 1/2 inch headspace. For more information on packing jars properly, see Canning Vegetables and Fruit - Packing Jars. Fill the boiling-water-bath canner half full of clean water; heat water to 180°F for hot packed jars. This heating process could be done while packing the jars. After the jars have cooled for 12 to 24 hours, they need to be check for a proper seal before they can be stored. First remove the screw bands and then use one of the following methods to check for a proper seal. For more information on testing processed jars for a proper seal, see Canning Vegetables and Fruit - Testing Jars for Proper Seal. 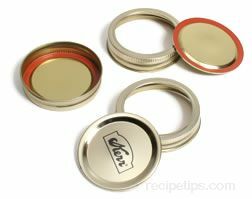 After checking for a proper seal, wipe off any residue on the jars and lids. Label the jars with the content and date of when they were processed. Store the jars in a cool, dry and dark place. 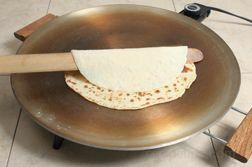 If the food is exposed to a lot of light or warm temperatures, it will have an effect on its color and flavor. The jars should be stored at temperatures between 50°F and 70°F. If stored under the proper conditions the canned food should be able to be stored for about a year before the quality is affected. It is extremely important that the tomatoes to be processed for the proper time to ensure that all bacteria have been destroyed properly. If in a high altitude area, be sure to adjust processing times accordingly. See the charts above for proper processing. 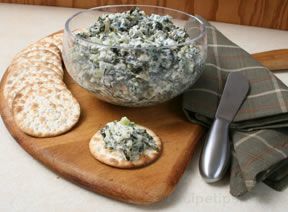 Look for fresh leakage or streaks of food that have dried on the jar that are coming from the top. For more information on storing canned vegetables and canning supplies, and canning safety, see Canning Vegetables and Fruit - Storage and Safety. For the best color and flavor in canned tomatoes, be sure to use quality tomatoes that have few blemishes and that they are at their prime maturity level and are not diseased. 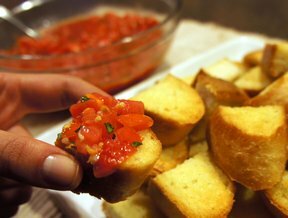 To keep canned tomatoes fresh year to year, only can the quantity that you will use up within a year. If processing time will be longer than 10 minutes, washing the jars in the dishwasher will be sufficient without having to sterilize them before using. They will be sterilized during processing. If located in a higher altitude, be sure to increase processing time according to the charts above. Water boils at a lower temperature at the higher altitudes, requiring a longer processing time. After processing, do not tighten screw bands. This may disturb the sealing process that has already started to form. 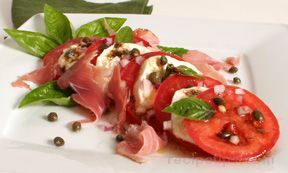 "I couldn't remember the process for peeling the skins off the tomatoes but I found the info I needed in this article. I needed it to make some canned salsa. Great tomato canning info!" "Wow! This is a lot of helpful information on canning tomatoes. 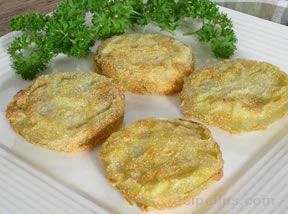 My mom use to can tomatoes every year but I never really got a chance to learn how from her. I want to start doing some canning myself so this information is just what I need. Thanks!"